Why not try an holistic approach to your health and well-being? 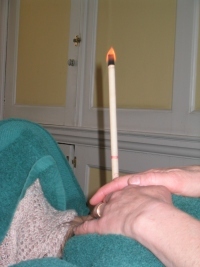 Hopi Ear candling (also known as Thermal Auricular Therapy) is a gentle, pleasant and non-invasive treatment of the ears based on a traditional practice originating among the (very spiritual) Hopi tribe of South America. It is a unique form of treatment that has become very popular and is now widely practiced in this country. Special 'candles', made from natural therapeutic ingredients, are used to treat Both ears. It can help in the treatment and relief of a surprising variety of conditions - and the soothing warmth created in the ear can be very comforting and revitalising. Ear candling can be used to treat both children and adults, both find the experience relaxing and soothing. After the candling treatment is completed, a facial massage with lymphatic drainage techniques will complete the treatment. The amount of treatments required will depend on the condition presented. A recommendation of three treatments over a four to six week period, to establish the degree of benefit and if any further sessions are required.